The bike's been serviced, WOF'd and rego'd, so all that remains to do is chuck some new rubber on it (leaving it late as current rubber still got plenty of k's left in it). Ferry is booked along with most of our accommodation and have even ordered the T-shirt! Still 3 more weeks of work to struggle through though - not sure how I'm gonna manage that! Apparently there's a few K7 Bandits starting to come into the country. My Dad has seen one in Napier and the bike shop at the link below apparently has a pre-production model. Yep, autumns here. 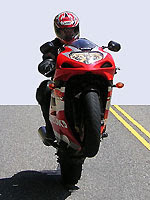 Usually a great time for riding - nice still, cool days - except for last weekend. It pretty much bucketed down all weekend so the poor old bike didn't even get out of the shed. Never mind weather is supposed to be pretty good this weekend so hopefully the bike will get some exercise this time around. 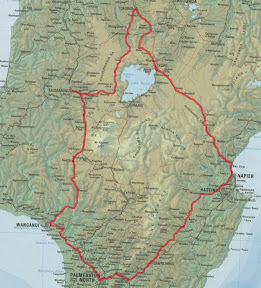 Not much on the calendar as far as organised rides etc goes until the Southern Cross. Time seems to be ticking over pretty slow. The bike is booked for a birthday service & warrant (rego also due!) and I might try to get a few more k's out of the tyres before changing them prior to the Southern Cross. Quarter to six is a bit early to be getting up on a Saturday morning (especially with the alarm set for a bit later than that) but with a decent ride on offer it didn’t hurt too much. Come 7am and Mark & I were down at the Cloverlea Tavern signing in along with a crew we know from the Bay (Warren: BMW R1200GS Adventure, Brett & Alistair: VFR800’s, and an older guy (67 – did his first Grand Challenge last year!) on an old BMW R100S). By 7:15 we’d signed up, found out where we were heading and said gidday to other guy’s so there was nothing stopping us from tearing off. Off we headed on a reasonably cool morning towards Wanganui. Not far out of town we caught up to a cop who pulled over (without indicating) and then tucked in behind us to follow us for a while. Not a good start. At Turakina I threw a few gestures at Mark suggesting we get off the main road and eventually he clicked on and we turned off and went through to Fordell on the way to Wanganui. 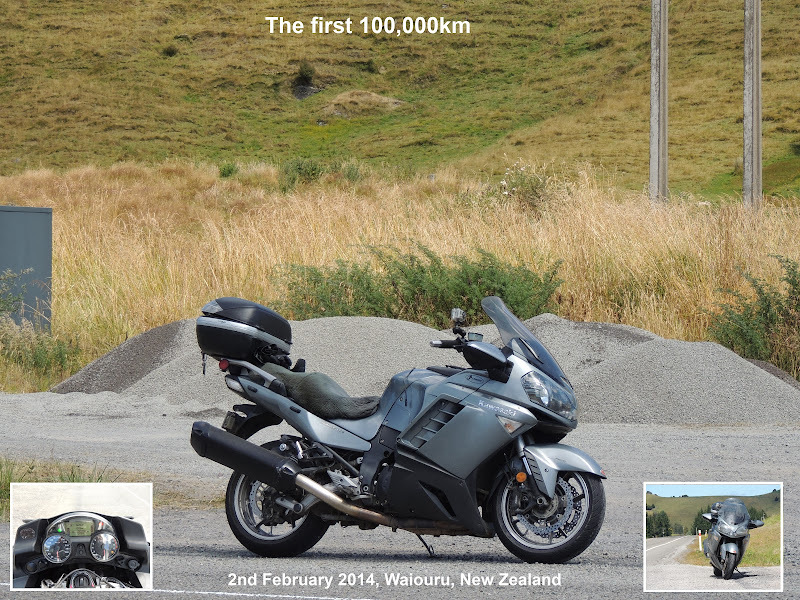 As we dropped into Wanganui we could see mist rising over the river – I hate riding in the fog! We didn’t hit the fog until on the Para-para’s just after I had taken off after a guy on a Hornet. The mist put a stop to that but we were able to resume play once over the top of the hill and back onto some flats. 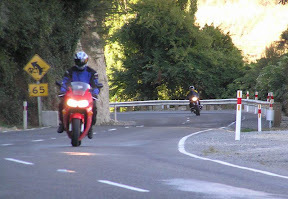 I stopped at Ruakawa and quickly grabbed my camera to get some photos of the guys coming past. Then it was back up the road to catch the other guys who had stopped at the falls for a look. Back on the bikes we were soon onto the boringly straight roads up through National Park to Taumarunui – our first check point. A quick top up to get the necessary docket and we were off again. Had another play with the guy on the Hornet and another guy going over the Waituhi Saddle before waiting for the other guys and leading them onto Whakamaru. At Whakamaru, Warren took the lead onto Tokoroa and when we pulled into the petrol station there was quite a few of us all lined up. After this second stop for a fuel docket he then took us on a great little back road into Taupo. By now we’d also picked up another guy (Richard – BMW R1100) who stuck with us until the finish. We had a quick stop here to remove excess clothing (getting pretty hot by now) before heading off over the Taupo road to Napier. Great fun on the hills but my tongue was definitely hanging out by the time we got into Bayview. This was our last checkpoint so we got fuel, had a drink & a snack before heading off back to Palmy via Highway 50. Very hot riding conditions – I was riding with my visor raised slightly to let more air in but this dried me out pretty quickly. Hung in there until Palmy where I realized that we were going to be under the 800km mark. Decided we’d see what happened when we got there before worrying about doing a couple more k’s. In the end, Mark & my bikes said 791.9k, the 2 VFR’s said about 780 and the BMW Adventure 760km – who was right? In the end the guys running the event weren’t too worried and we got our badges, had a well earned drink and a nice meal. All in all a great ride on a perfect (if a bit hot) day and good practice for the Southern Cross. Interestingly (considering we’d never met 2 of the guys), all in our group of six are doing the Southern Cross so we’ll be catching up again at Cape Egmont come April 23rd. I've always wondered why Suzuki hasn't built a decent sports-tourer to compete with the likes of the Honda ST1300, Yamaha FJR1300, the new Kawasaki GTR1400, Triumph Sprint ST and several BM's. They used to have the old GSX1100F but it's been a long time since you could get something like that. They've always had good engines for this sort of bike and as a bit of a Suzuki nut it's been a bit disappointing that they haven't had something on offer. Of course the bike would have to have all the gear: luggage, shaft drive, good fairing, adjustable screen, ABS, big tank, comfy seat and riding position, grunty motor etc. 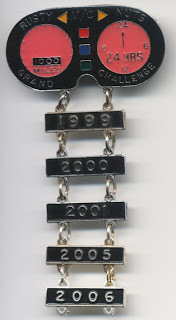 Both Mark & I have had our entries accepted into the 21st Rusty Nut's Grand Challenge (1000 miles in 24 hours) on 13-14th October. We got our entries in early and so are in the second group to leave - start time 15:03. Looking forward to it - especially after watching the DVD of last year - just have to get the Southern Cross done first (April/May). Only just found out about this ride on next Saturday (10th March). 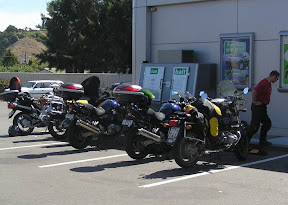 The Central Districts Motorcycle Touring Club are holding an 800k's in a day run. The ride starts 7am at the Cloverlea Tavern car park, Palmerston North and for your $30 you get a badge & a meal at the end of the ride (8pm).